Casselman Mennonite Church in Grantsville, Maryland in 1948. Source: Mennonite Community Photograph Collection, The Congregation (HM4-134 Box 1 photo 010.1-6). Casselman Mennonite Church (Mennonite Church) was located several miles south of Grantsville, Garrett County, western Maryland, in the beautiful valley of the Casselman River. 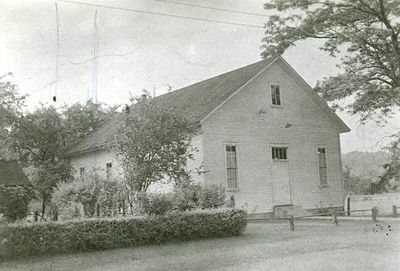 The community had its first services in 1874, probably in the homes, and later in the Ridgeley schoolhouse. The Casselman church was built in 1889. In 1952 it had a membership of 55, with Milton B. Miller serving as bishop. It was a member of the Southwestern Pennsylvania Conference. Hege, Christian and Christian Neff. Mennonitisches Lexikon, 4 vols. Frankfurt & Weierhof: Hege; Karlsruhe: Schneider, 1913-1967: v. I, 335. Kaufman, Ammon. "Casselman Mennonite Church (Grantsville, Maryland, USA)." Global Anabaptist Mennonite Encyclopedia Online. 1953. Web. 25 Apr 2019. http://gameo.org/index.php?title=Casselman_Mennonite_Church_(Grantsville,_Maryland,_USA)&oldid=144930. Kaufman, Ammon. (1953). Casselman Mennonite Church (Grantsville, Maryland, USA). Global Anabaptist Mennonite Encyclopedia Online. Retrieved 25 April 2019, from http://gameo.org/index.php?title=Casselman_Mennonite_Church_(Grantsville,_Maryland,_USA)&oldid=144930. Adapted by permission of Herald Press, Harrisonburg, Virginia, from Mennonite Encyclopedia, Vol. 1, p. 523. All rights reserved.